Buick 215 in a Lark? - Racing Studebakers! Haven't been here in a while, but just picked up an aluminum Buick V8 (215 stroked to 266) with a T5. Has anyone put one of these in a Lark? My 60 2dr sedan has been asking for a heart transplant and I'd like to drop the Buick in there. Go for it, I will help you in any way I can. Love to do odd swaps. The only Buick engine I have ever put in anything is a 3.8 Turbo V6 in an MGC. Thanks Alan! After I get some room in my carport, I'm going to take a bunch of measurements to see what my fit challenges are going to be. The guy I bought it from was going to put it into a Sunbeam Alpine, but ended up finding and purchasing a real Tiger, so he decided to sell the drivetrain and bare bones Alpine to fund the Tiger restoration. I briefly considered putting the Buick into my Jensen Healey, but I'm keeping it an original runner. And selling it. The Lark already has a Ford 8" 4.11 posi in it, and I have the disc brake parts for the front. I'm thinking the 170/3spd must weigh the same or more than the Buick, so the springs won't need to come out. Have Bilsteins for the front too, with sway bars front and rear. I'm thinking this might end up pretty fun! I'll bet that MGB was a neck snapper! The Studebaker is a big block. If it fits, anything fits. FWIW, I've done Buick V8 swaps into MGB and Datsun 510, among others. The aluminum B-O-P fits most anything, weighs next to nothing. The horsepower will be about the same as the Stude V8, but taking 200# off the nose and adding a couple more gears will make it seem a lot faster. I'm encouraged. This will be my winter project. I've had the Lark for 10 yrs and after the 170 died, I've been neglecting it. The 299 Stude I have also been collecting parts for will now go in my 58 Scotsman 4dr with a 2004R. So I have a Fidanza aluminum flywheel, 62 Hawk 4spd bellhousing, Centerforce clutch to be sold. PM me about the flywheel and clutch. This is a very compact engine. I had one in a Rover 3500 SDI sedan when I lived in Belgium. It was a nice engine. 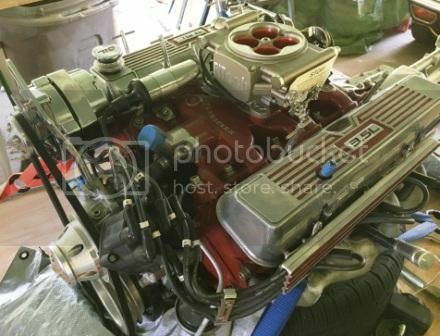 (GM sold the engine design and tooling to Rover about 1965) Many of the engines in the US had corrosion problems due to lack of using antifreeze. The Rover engine was a little heavier at about 430 lb. with accessories. In later years they had a stroked version that was about 4 liters. There is even a shop called the Wedge shop that sells speed parts for the engine. They could tell you what fits your engine. The only problem I have found with this engine design is the oil pump and filter. You may have to use an adapter and run an external filter. Only way to tell is to put it in and see what hits and fits. Note, you may not have enough engine weight to move the front suspension springs...even a little bit. Weight the front end after the swap is complete. Find a spring manufacturer and talk to them about coil springs. I built one of those for my brother years ago, a fun little engine. I did some cylinder head work, a small hot rod cam. It was actually in a 63 (as I recall) Buick (Skylark ?). You should have plenty of room. Show us some pictures during and after the installation is complete. I always liked those motors ever since a friend had one in a Skylark. Would think it would be right at home in a Lark. I drive a Jeepster Commando now daily and have been really impressed with the 225 Dauntless V6. A really great motor in a lightweight 4WD application when coupled to the heavy flywheel. I picked up another as a spare (mine has 150K+) that came out of a VW Thing of all things. It was built to run Baja 1000 but bent a pushrod mid race. I think they would have been better off hanging the 215 off the transaxle instead. Motor was completely rebuilt and owner removed to do a Subi swap. Anyways, it’s sitting on a stand ready to go with Offy 4BBL intake and small Holley. Although not as light as the Aluminum V8, I thought it might make for a fun swap into a smaller car like a Lark as well. Alan probably has one in his rider mower, with twin turbos on it of course! Anyway, have fun with your project! Those aluminum V8s do get around. I have a friend who built a 4-passenger sand rail/dune buggy with a 215" bolted to a VW transaxle. Yes, the 215s do end up in strange places. I have what was supposed to be a good "core" 215, but when every removed bolt took out the block threads with it, I realized that it was good only for parts. 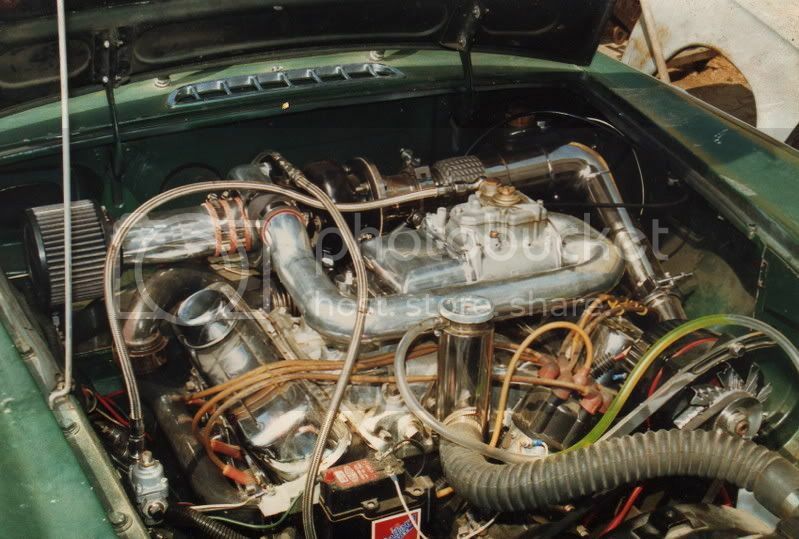 This engine was trial fitted in a Lotus Europa. Lordy, that MUST have been a tight fit. . . Here's the Lark the Buick is going into. Still need to put brakes and a fuel system on it before test fitting the engine. Any chance someone has the specs on the stock Lark VI front springs? Free length and spring rate? I'm thinking of dirt track car 5" diameter springs of a much lighter rate than stock. The length will be 14"-14 1/4" and the rate will be about 225-235 lbs/inch. The reason I am so vague about the dimensions, is I have put many springs on my spring rate tester for a friend that had about the same set up you have and we went through 7 or 8 springs to find 2 that were close to the same.